JERICHO, South Africa, June 17, 2010 (ENS) – In World Cup soccer Wednesday, Uruguay won 3-0 over South Africa’s beloved Bafana Bafana team, imperiling the hosts’ chances of advancing to the second round. No host nation in the past 18 World Cups has been eliminated in the first round, a prospect that South Africa now faces. But for the residents of Jericho, a village near Johannesburg, Wednesday’s match was a win-win situation. 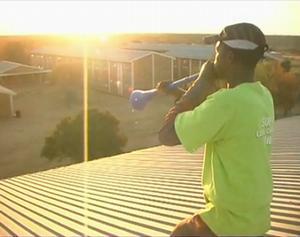 They viewed the game at a new solar-powered public viewing area equipped by Greenpeace and constructed by local youth. A large-screen TV powered by the Sun was placed in the Jericho community hall. The entire set up is powered by solar panels and generators erected by schoolchildren, who were trained by Greenpeace for the task. 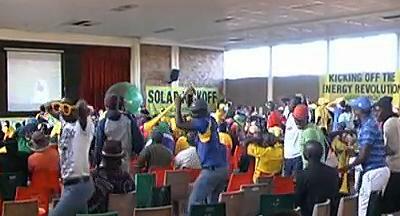 Greenpeace Africa kicked off this Thangkollo ya Solar (Solar Kick Off) project to demonstrate the potential of renewable energy sources in South Africa. “What the Jericho project shows is that South Africa doesn’t have to rely on outdated methods to literally empower its people. The country has some of the best renewable energy sources in the world in the form of sun and wind,” said Nkopane Maphiri, Greenpeace Africa’s climate campaigner. “We want to make sure that South Africa doesn’t commit a home goal by not taking advantage of its renewable energy resources,” said Maphiri. Youth Day, an official South African public holiday, honors the deaths of hundreds of schoolchildren who helped to change the course of the country’s history. On June 16, 1976, starting in Soweto, schoolchildren went on a peaceful march against the use of the Afrikaans language as the medium of instruction in black schools. They were met by gunfire from the apartheid security forces in Orlando. Children died, sparking riots that soon spread across the country and placed the human rights violations of the apartheid government front and center on the world agenda. “It’s because of these numerous aspects that Greenpeace aligns itself with the youth and old people of Jericho some of whom were present during the activism days against apartheid,” Maphiri said. Jericho’s solar viewing screens are an example of Greenpeace’s Energy [R]evolution campaign in practice. A key area of the campaign is about investment in people and local communities who can install and maintain renewable energy sources. The latest Energy [R]evolution report, published last week, provides a detailed plan for cutting carbon emissions while achieving economic growth by replacing fossil fuels with renewable energy and energy efficiency. The phase-out of fossil fuels offers benefits such as energy security, independence from world market fuel prices as well as the creation of millions of new green jobs. “If it hadn’t been for Greenpeace and solar power the football festival might just have by passed us by,” said Amos Nkotsi, a community journalist who also took part in a solar workshop in Jericho. The Solar Kick Off viewing area project was supported by Solar Generation, the Greenpeace Switzerland Youth Support Centre, and Umweltstiftung Greenpeace. Greenpeace is campaigning on the belief that if the government embraces the Energy [R]evolution pathway by investing in renewable energy and encouraging projects such as the one in Jericho, it will reduce carbon emissions and could create 78,000 new direct jobs in the renewable energy industry by 2030. 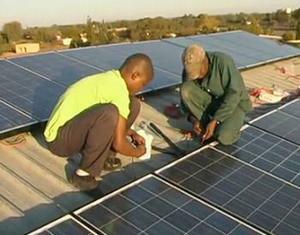 This figure of 78,000 new jobs is part of the initial findings of the as yet unpublished report “South African Energy Sector Jobs to 2030” commissioned by Greenpeace Africa and authored by Jay Rutovitz of the Institute of Sustainable Futures at the University of Technology in Sydney, Australia. The report will be officially published in August 2010. If other African governments also invest in a greener future, Greenpeace maintains, 1.8 million green collar jobs could be created by 2030. By 2050 over three-quarters of the electricity produced in Africa will come from renewable energy sources. Key to making the Energy [R]evolution a reality is creating a system in which investment costs for a renewable future are shared fairly under a global climate regime, Greenpeace says. The advocacy organization is urging governments to adopt the Greenhouse Development Rights Framework, an investment-sharing mechanism that could help Africa. This system calculates national shares of global greenhouse gas obligations based on a combination of a nation’s contribution to climate change and its ability to pay. Use of this framework would place the burden of paying for development of renewable energy in Africa on industrialized countries, which base their economies on consumption of the very fossil fuels that emit greenhouse gases when burned for energy.